ZIAJA 2015 CHRISTMAS GIFT COLLECTION! This Christmas, Ziaja are on a quest to spread some festive cheer with their beautiful customised Christmas gift sets. All under €17.99, they are an excellent addition to any stocking. Ziaja Natural Olive Gift Set €9.99: Contains pure olive shower gel, olive body lotion and olive hand and nail cream. Ziaja’s Olive range is an intense moisturiser which is perfect for the winter months and this gift set includes a selection of rich nourishing products for any daily skincare regimes. Ziaja Natural Olive Deluxe Set €17.99: Includes natural olive hand and nail cream, a gorgeous lip balm, nourishing cream, duo phase make-up remover and a natural olive cream. These olive essentials will be perfect for the cold winter days. Ziaja Men Gift Set €9.99: Contains shower gel, daily moisturising cream and an anti-perspirant. This is a great gift set containing the essentials for him - a refreshing shower gel, a daily matt moisturiser which suits all skin types and a long lasting anti-perspirant which will leave him feeling fresh all day. 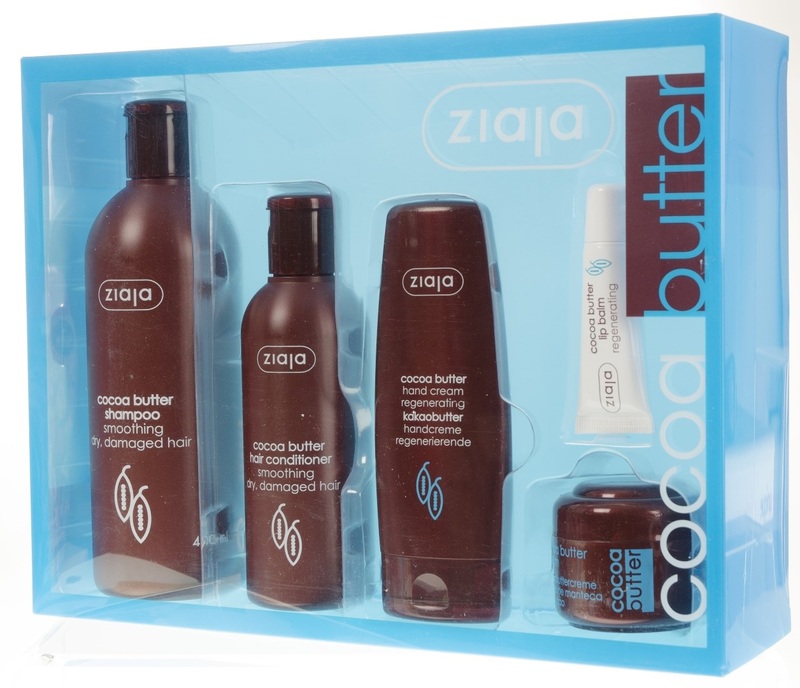 Ziaja Cocoa Butter Gift Set €9.99: This set has cocoa butter creamy shower soap, cocoa butter hand cream and cocoa butter body lotion. Cocoa butter is one of the most nourishing ingredients for the skin. Ziaja’s Cocoa Butter skincare is a huge favourite with Irish consumers around the country. Ziaja Cocao Butter Deluxe Set €17.99: Contains cocoa butter shampoo, conditioner, luxurious cocoa butter hand cream, lip balm and the butter cream. A best seller in Ireland, Ziaja Cocoa Butter products hydrate and at the same time soften dry skin and leave it glowing to perfection. Ziaja Goat’s Milk Gift Set €14.99: Enjoy a goat’s milk day cream, night cream and goat’s milk hand cream. Ziaja goat’s milk range has become a best seller for the brand in Ireland since its launch over two years ago. Goat milk has the closest PH balance to human skin, so it is perfect for the body and won't cause irritation. WHERE TO FIND IT: shop online @ www.originalbeauty.ie, shaws department stores and from independent pharmacies nationwide. Ziaja is a family-owned company founded in 1989 by pharmacists Aleksandra and Zenon Ziaja. Today Ziaja is the market leading skincare brand in Poland and Ziaja products are trusted and liked by customers around the world. This year Ziaja is celebrating 25 years of timeless beauty. Ziaja has a staggering 1,000 products encompassing skincare, dermo cosmetics, body & haircare – a range of products for every stage of a woman’s life and her family too. Ziaja’s ethos is to develop fantastic, affordable daily care products while ensuring they are a source of pleasure and well-being. All Ziaja products are ph balanced, hypo-allergenic and contain innovative formulas that blend natural & organic active ingredients with scientific know how. Packaging conveys clear and honest messages, all products are dermatologically tested and are NOT tested on animals. Over a short few years, Ziaja has built a loyal Irish customer following, women who trust the brand, love the products and actively recommend them. Ziaja has been highly praised by beauty experts and dermatologists and often hailed as the budget beauty hero. #DeiseBloggers Event- A great day out!